The first case is against 22 accused under IPC sections of criminal conspiracy, cheating, forgery, harbouring an offender, as well as sections of MP Recognised Exams Act 1937. The last case has been registered under IPC sections of criminal conspiracy and cheating on the basis of an FIR against two accused persons for impersonation in the police constable recruitment exam 2012. 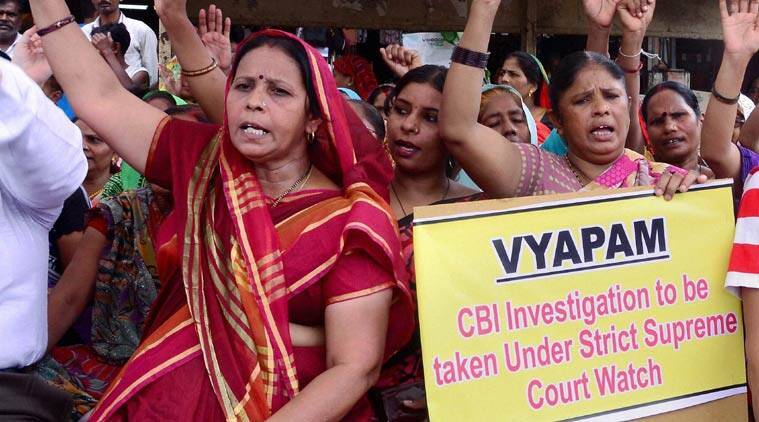 The CBI registered eight FIRs related to alleged Vyapam scam cases on Saturday. * The first case is against 22 accused under IPC sections of criminal conspiracy, cheating, forgery, harbouring an offender, as well as sections of MP Recognised Exams Act 1937. It is based on an FIR dated April 29, 2013, alleging impersonation by some persons for five candidates for the Vyapam-conducted Pre Medical Test (PMT) 2011. * Another case is against 28 accused for cheating, forgery and criminal conspiracy under the IPC, as well as sections of the MP Recognised Exams Act 1937. It is based on an FIR dated November 13, 2013, alleging impersonation by some persons with regard to 10 candidates for PMT 2012. * A case has been registered against two accused under IPC sections of cheating and forgery on the basis of an FIR dated February 7, 2014, alleging impersonation in the constable recruitment examination 2013(II). * A case has been registered under IPC section of criminal conspiracy, cheating and forgery, 1937 on the basis of an FIR alleging impersonation in the PMT 2009. The case has been filed against six accused persons. * A case has been registered against two persons under IPC sections of criminal conspiracy, cheating and forgery, on the basis of an FIR, for cheating by impersonation in PMT 2009 conducted by Vyapam. sections of the MP Recognised Examinations Act, 1937 on the basis of an FIR, for impersonation in PMT 2009. * A case has been registered under IPC sections of criminal conspiracy, cheating and forgery, and sections of the MP Recognised Examinations Act, 1937 on the basis of an FIR against one person for impersonation in the police constable recruitment exam 2012. * The last case has been registered under IPC sections of criminal conspiracy and cheating on the basis of an FIR against two accused persons for impersonation in the police constable recruitment exam 2012.